I love a dinner that is quick to prepare, smells amazing while cooking, and tastes even better. This is one of those meals. I love roasts and this recipe is one of my favorites. It doesn’t take long to prepare and the ingredients are super cheap. In fact, I always have the ingredients on hand at my house, so all I need to do is pick out a roast at the grocery store! Now that Fall is officially here, this recipe is the perfect for me to utilize my slow-cooker. Not only will it make my house smell amazing, but it will allow me more time to spend with my kids or clean house. But, between you and me, I would rather spend my time playing Candyland with my kids! Meat and vegetables, slow-simmered to perfection with a barbecue gravy that makes your weeknight dinner easy and mouth-watering. 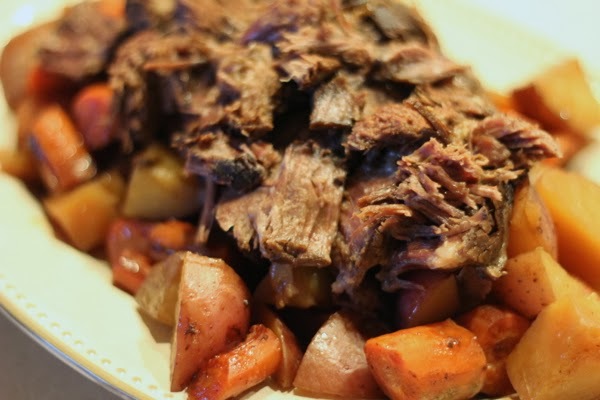 Place meat in slow-cooker and top with potatoes and carrots. Pour barbecue sauce over the top. Cover with lid and cook on low 8-9 hours or high for 6-7 hours. Remove meat from slow-cooker and cover with foil. Let stand for 10 minutes. Remove vegetables with slotted spoon and place on a serving platter; cover with foil. Mix flour and water. 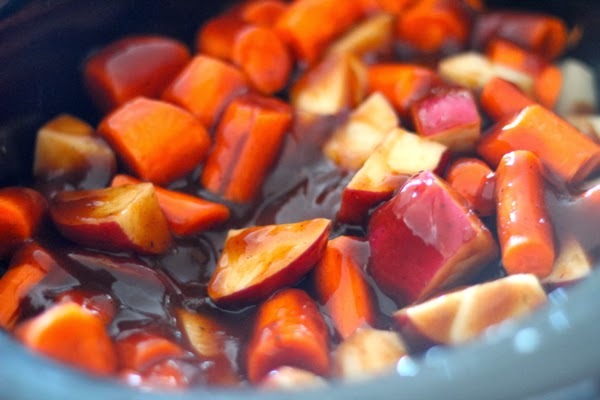 Stir into barbecue sauce in the slow-cooker until thickened. Slice meat and add to the platter of veggies. Top with gravy. Oh you have to try coke. You don't taste it if that's what your worried about. The coke is acidy which eats at the roast causing the meat to be melt in your mouth. When I was younger my mom would make roasts and they were so, so. I hated having a tough piece of meat. Once Byron & I lived together though and I used the coke I love roasts and am never disappointed. I'm impressed with you photo - it looks so good. I can never take a photo of meat and gravy that looks appetizing at all, but I'd like to pull a serving of yours right out of the screen. Thanks for linking up! We tried this recipe the other night. I was kinda nervous, as I usually am whenever I'm not too sure I bought the right thing at the store. They had different cuts of pot roast, and I had no idea which one to get. We ended up going with the topside roast...which I still don't know the difference between that and a regular pot roast. This came out really good! The meat was so tender we were able to cut it with our forks. A whole pot roast for just the two of us is a lot, so Rob took the rest of it to work with him the next day for lunch. When he came home the container was completely empty and he said a couple of guys finished it off and really liked. They all think I'm a good cook, and I can honestly say that is only because of your recipes and blogs! You are so sweet! I'm so glad your finding recipes that you guys like and that you are having fun in the kitchen. This is one of our favorites too. I like it because it doesn't require a ton of work. And I usually buy whatever boneless pot roast is the cheapest and looks like will feed my family of five.